Indoors and outdoors blur in this bathroom suite by Robert Hidey Architects. The beauty of classical Italian architecture will never fall from favour on the other hand, a bit of pampering modernity goes a long way too. 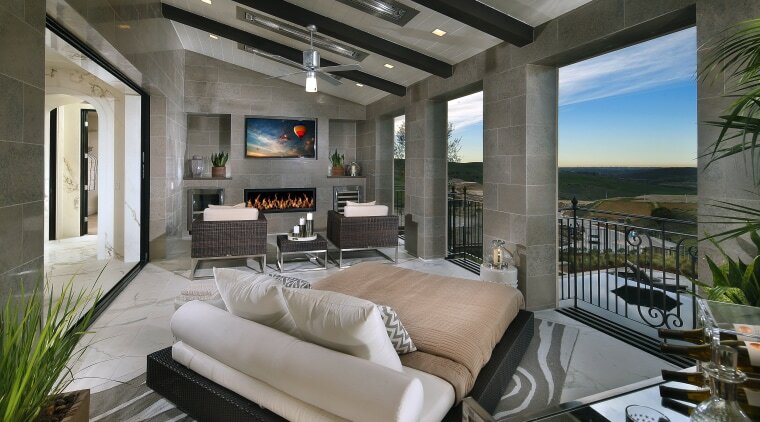 In this indoor-outdoor master suite the two merge to opulent effect. The suite and the home around it were designed by Robert Hidey Architects, with Sherman Jones as project director. "One of the most luxurious aspects of this suite is the open balcony," says Jones. "With no near neighbours, the owners can exit the bathroom through the stacking glass pocket doors and relax by the outdoor fireplace, augmented by ceiling heaters, while taking in the views." "This house has an Italian rustic sensibility, seen in touches like the stone cladding that runs into the balcony, the shiplap ceiling and exposed wood beams, and ornate iron guard railings." 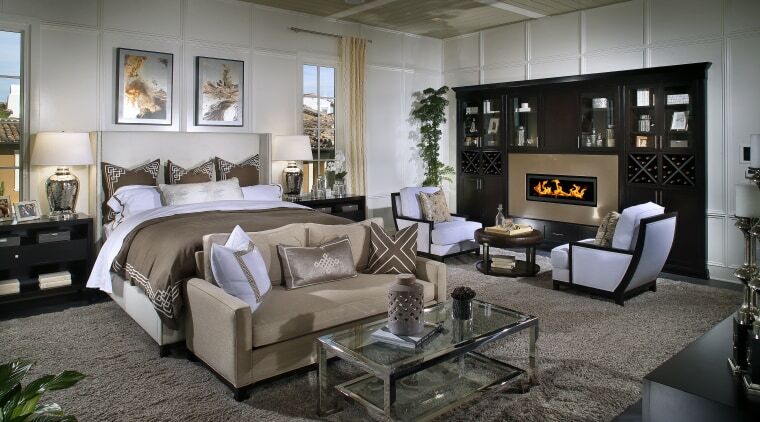 This grand master suite reflects a welcoming fusion of typical classical Italian elements and modern convenience, such as the stainless steel gas fires. The bathroom furthers the Mediterranean aesthetic, with classic deep archways the first connecting to a walk-in dressing room and the second, symmetrically opposite, leading to the master bedroom. Paonazzetto, a delicate Italian marble with an elegant veining, features on the floors and walls and continues outside as the balcony floor. "The vanity cabinet face has a classic Roman feel, too. However, this is topped with a durable engineered stone which in turn has a freestanding basin on it," says Jones. "These are both modern inclusions. Even the vanity's cantilevered effect is a fairly modern concept and there's an instant hot water system hidden behind the scenes." Rustic-look shiplap ceilings on the balcony of this master suite are continued in the master bedroom. This balance of the classic and modern is played out throughout the space. The mirror above the vanity includes a vanishing television and the shower stall is a contemporary picture of frameless glass. Of course the glass pocket doors that let the bather take in the scenery from the tub or the lounger are another modern touch.